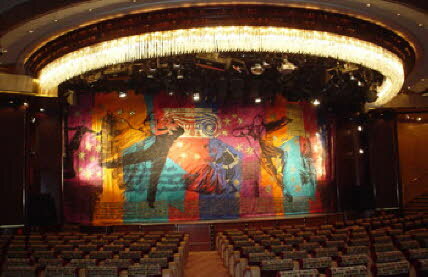 Following the successful completion of Starlight Serenade, I was commissioned to embroider a stage curtain for the Palladium Theatre on the new cruise liner ‘Grandeur of the Seas’. 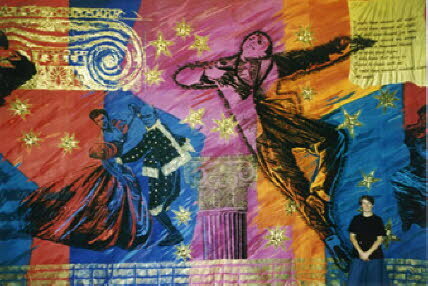 The curtain Let’s Dance, depicts stars of stage and screen, including Gene Kelly, Fred Astaire, Ginger Rogers, Yul Brynner, Deborah Kerr, Judy Garland and Rita Heyworth. The figures float across an abstract painted background. Techniques include fabric painting, screen printing, block printing, appliqué, freehand machine embroidery and applied Austrian crystals and beads.